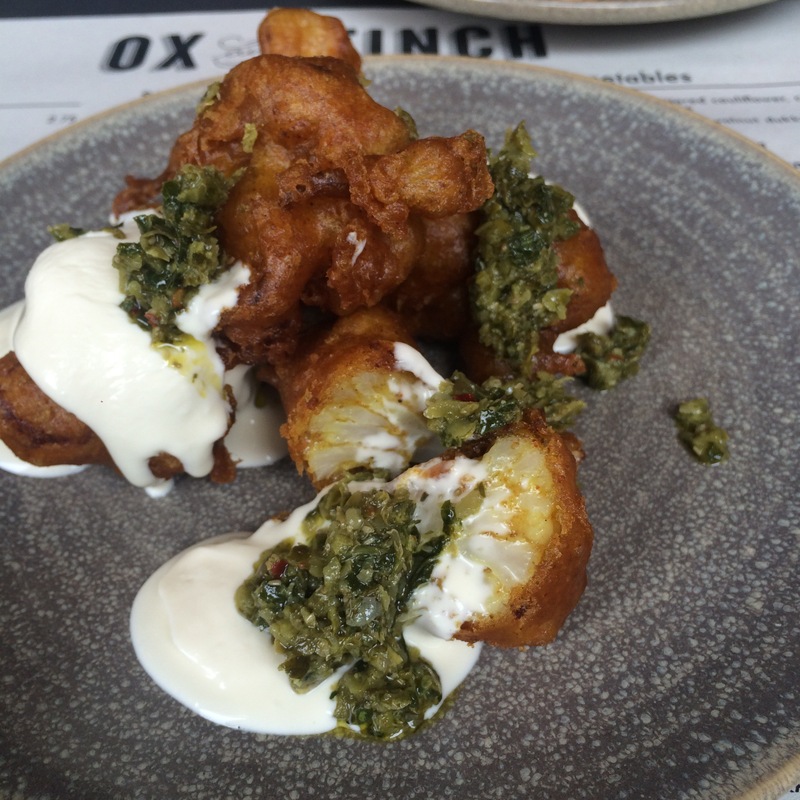 I’ve had my eye on Ox and Finch since it opened and it became one of those places that was on my hit list, yet I managed to not actually go. Divine intervention arrived in the form of Citizen M wanting to work collaboratively with me on a blog post about where to go in Glasgow. 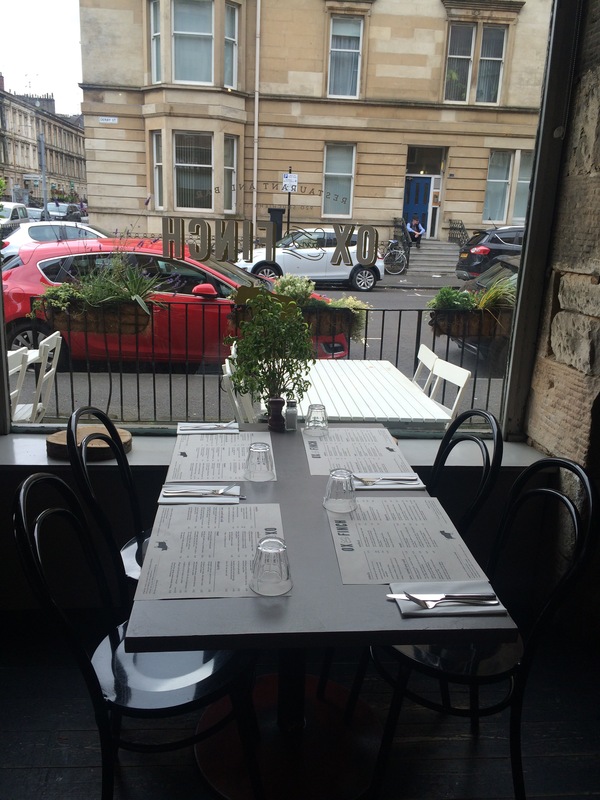 This is definitely somewhere to go, and I’m going to say that it’ll be one of my top places to recommend from now on! 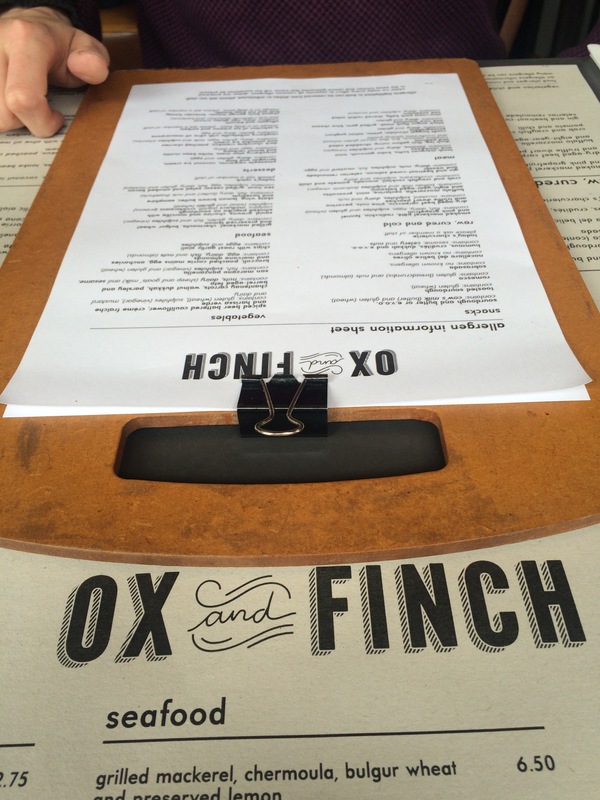 Ox and Finch fits in with all the cool interior design kids in the West End – sleek, classy and brightly presented shabby chic. I would book a table as it is a popular place! 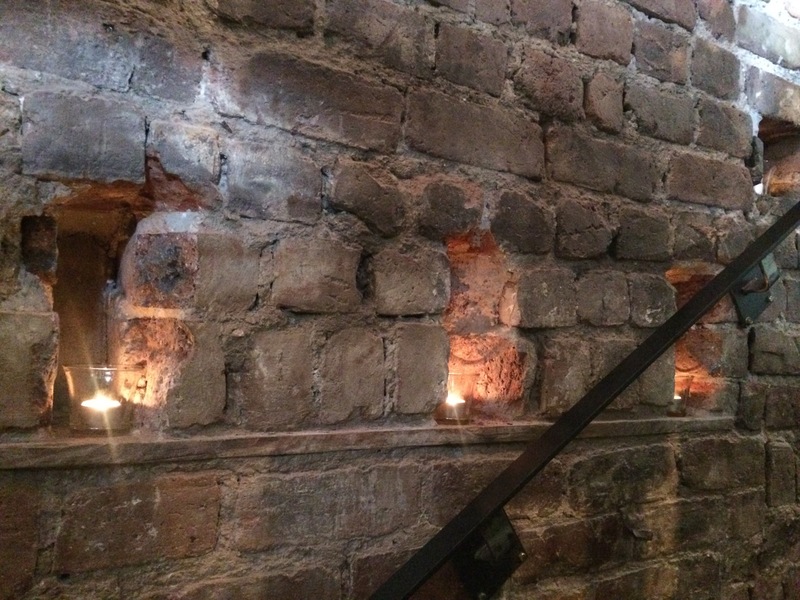 I love the castle themes stairs to the downstairs area. My first point of praise: we notified them about a pesky nut allergy and were provided with an in depth allergen menu. This is something we wish that all restaurants did. They also offered to tailor dishes to suit. Fan dabby dosy! 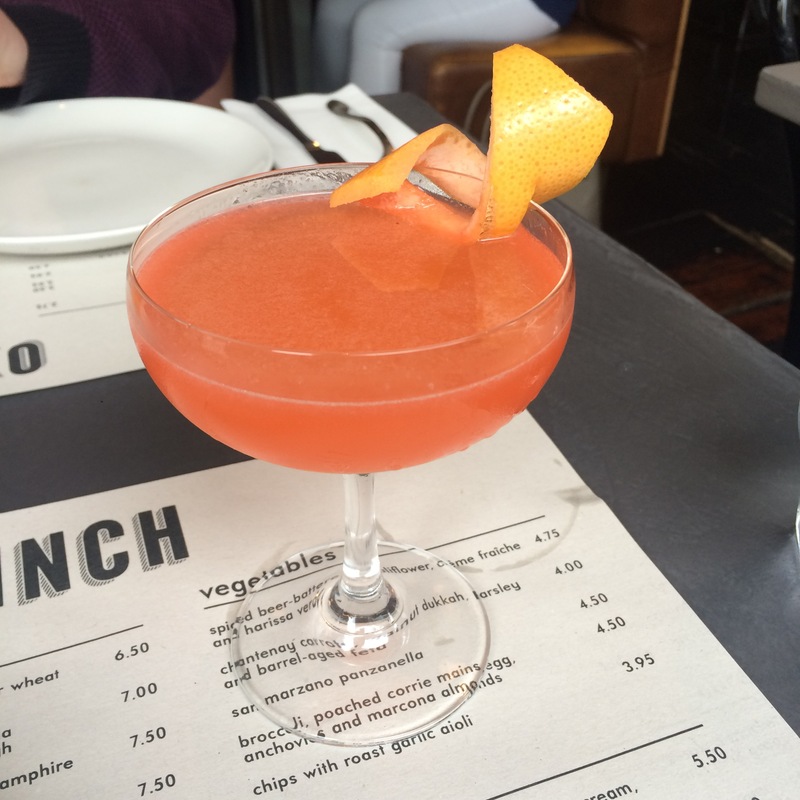 The Botanist gin, Aperol, St Germain & citrus. It’s on the beautiful side of bitter. Lovely. 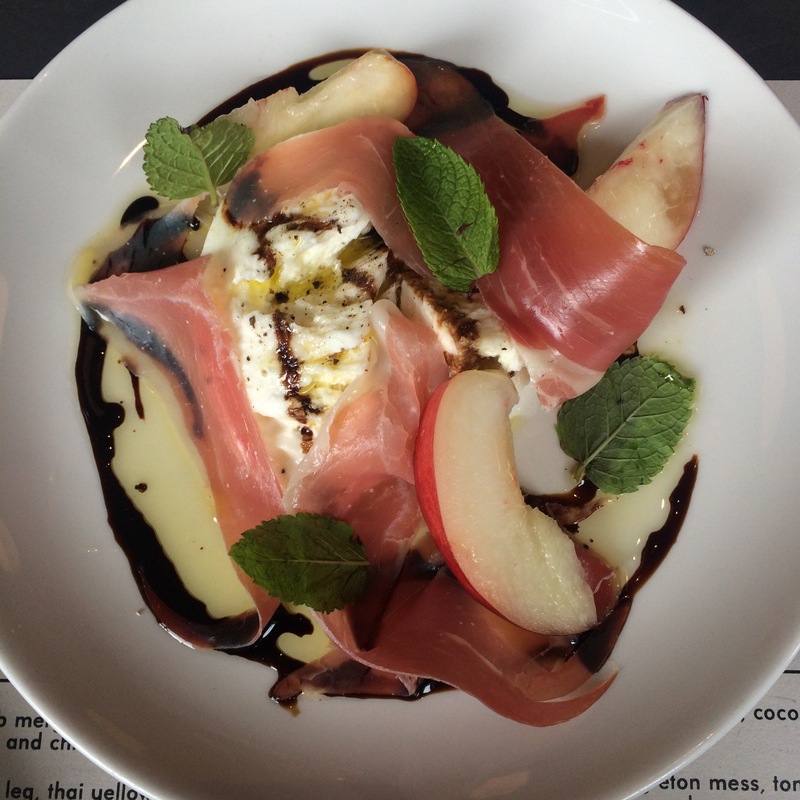 Buffalo Mozzarella, Mint, Nectarine, Prosciutto with 8 year old Balsamic. 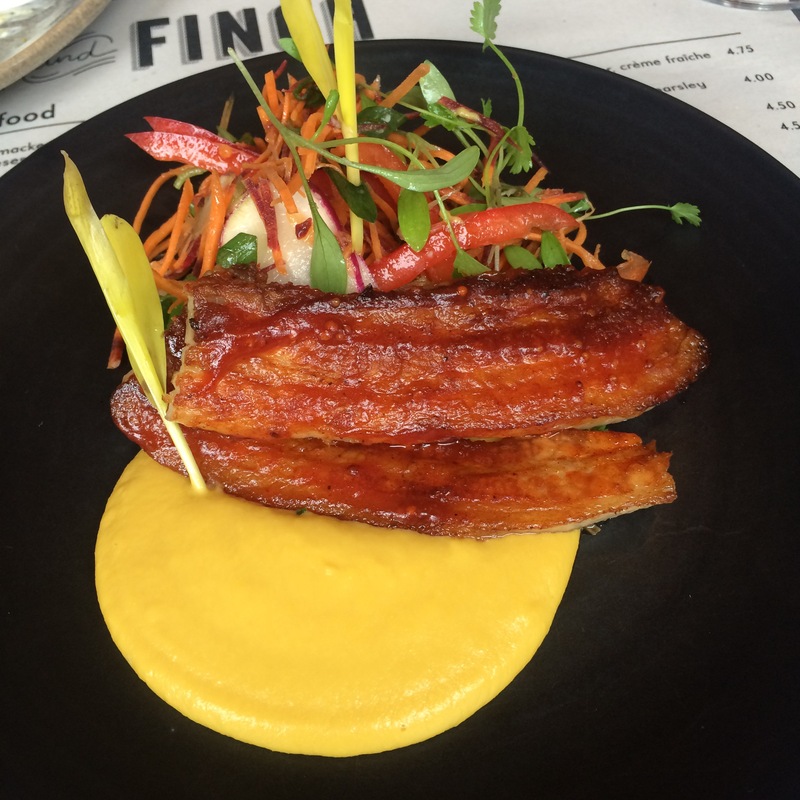 This dish has an amazing flavour profile and it was just glorious. The balsamic vinegar tasted like no other I’ve tried and at first I wasn’t sure I liked it due to the darkness in taste. 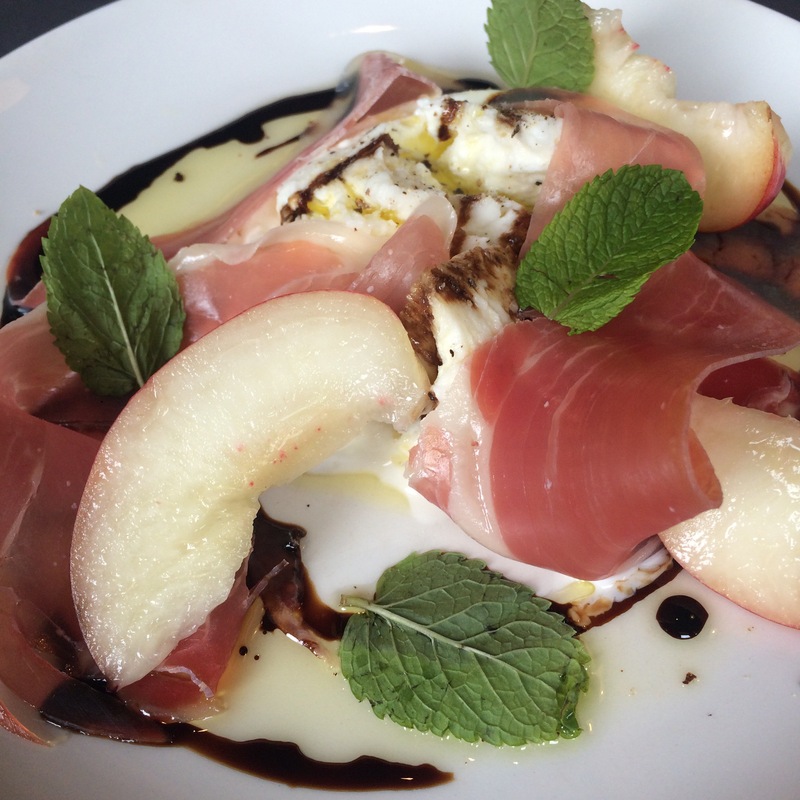 The darkness died down very quickly to reveal the creamy mozzarella, salty prosciutto and tangy nectarine. So simple, but so well thought out. Freshness in a shell. 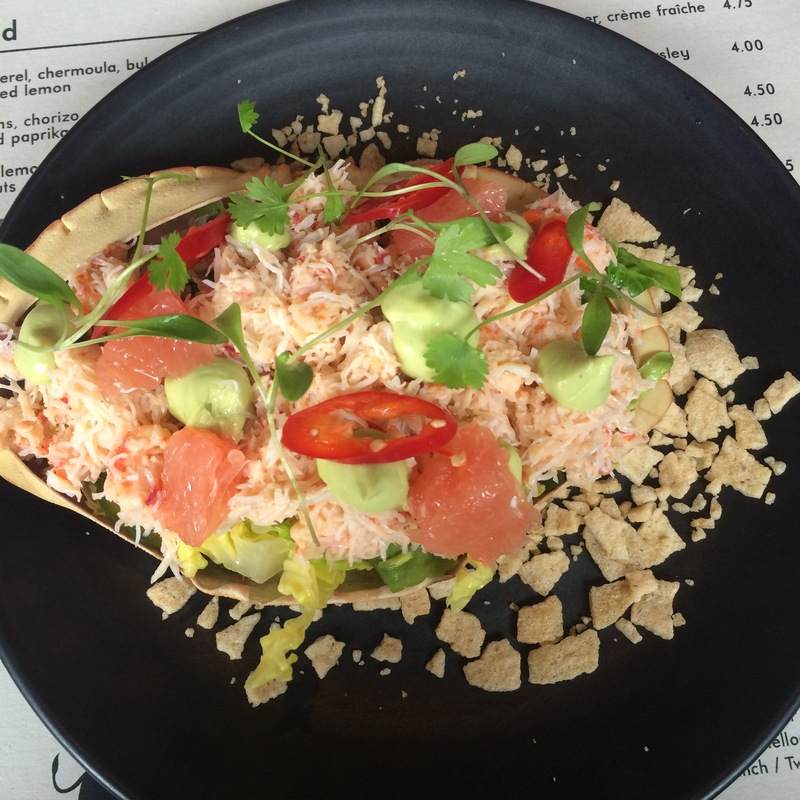 Gorgeous (and plenty of) crab meat with crayfish served in the shell with avocado purée and fresh chillies. It was a creamy and relatively plain dish but the tangy Pomelo and fiery chilli made the mild mixture exciting to eat. 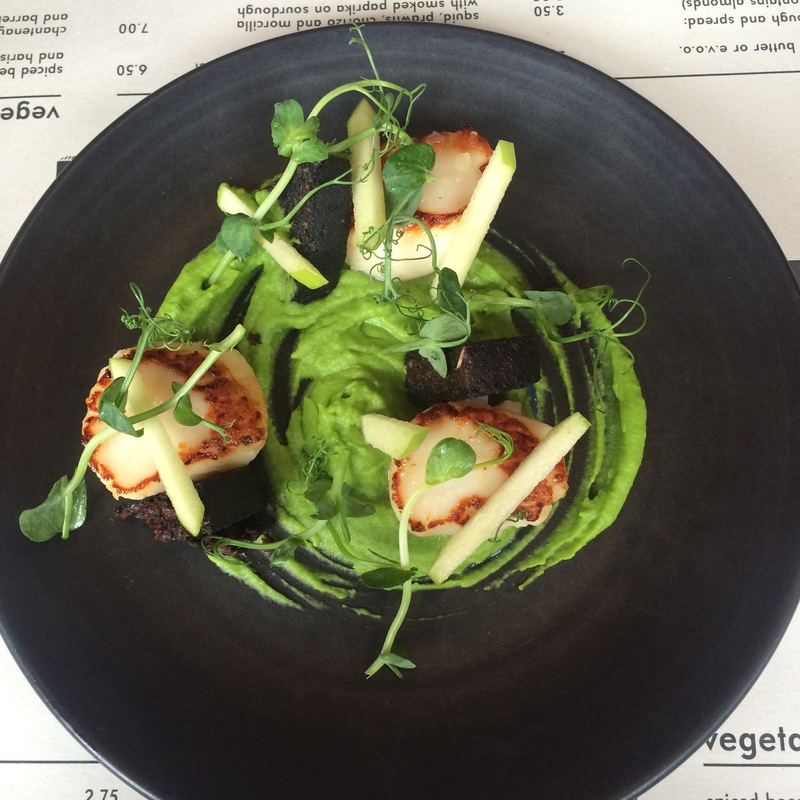 Seared Scallops, Pea Purée, Black Pudding & Apple. The minute we were told that scallops were on the specials menu we gave each other an approving nod and immediately ordered it. There isn’t much to say here as what we were served was simple and delicious the way it was. 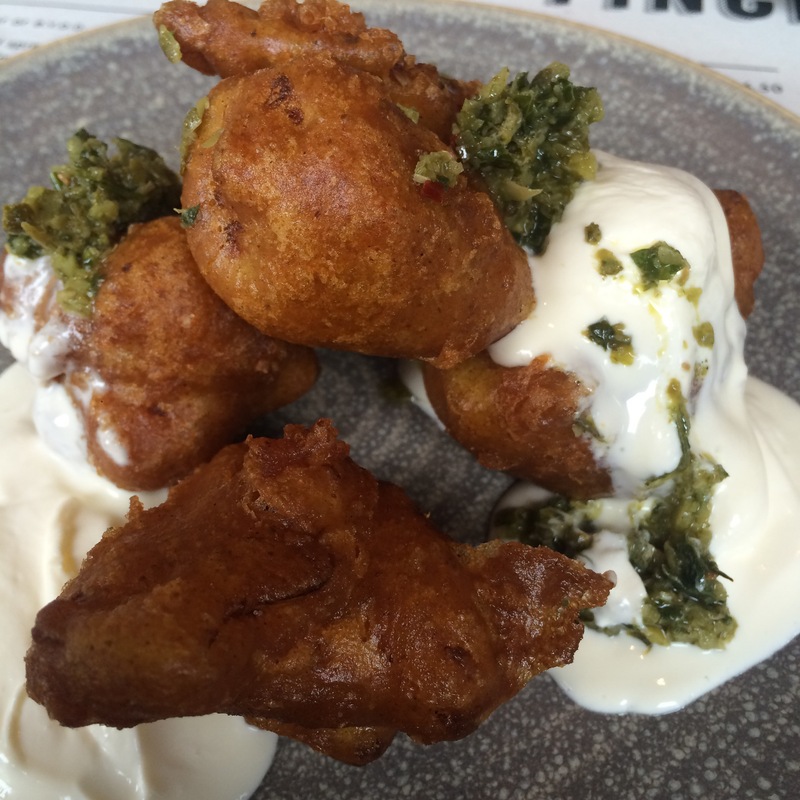 What we LOVED was the generous dollop of pea purée we got. Wonderful! I hate when the pretentious style of the dish kills the portion, especially with sauces! This was beautifully served AND we had plenty for dippin’! 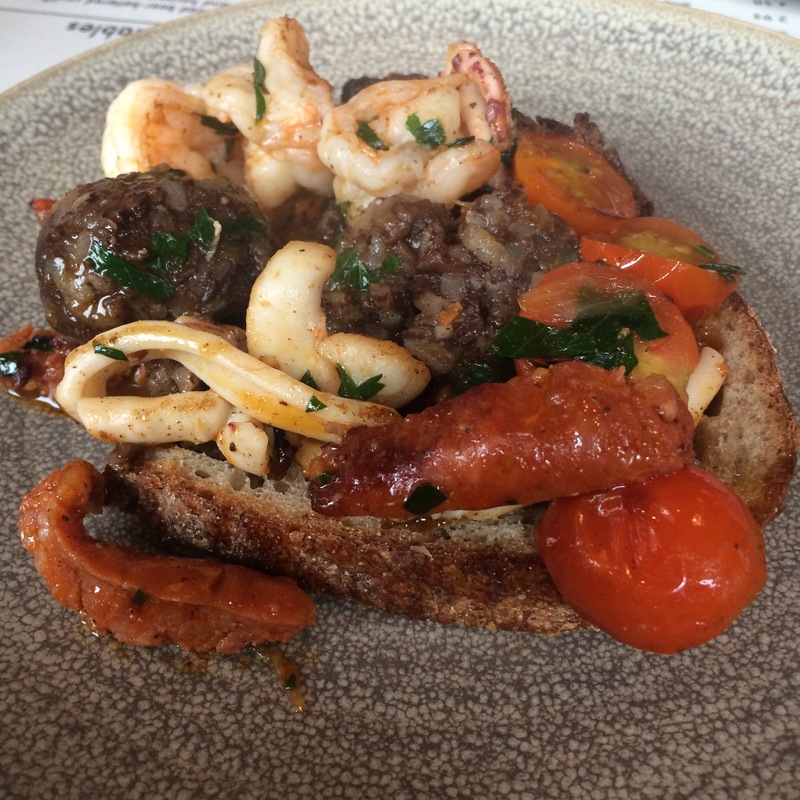 I’d never heard of, never mind tried, Morcilla before this visit and they/it wasn’t what I expected. 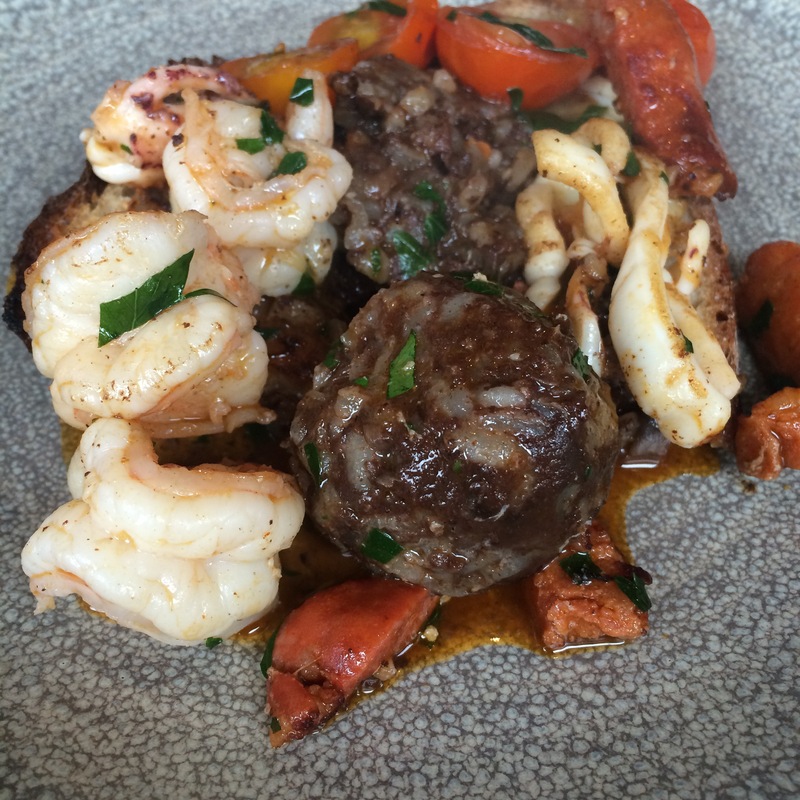 I expected black pudding themed sausage, but they’re like soft sausage and rice meatballs. The dish was absolutely amazing. 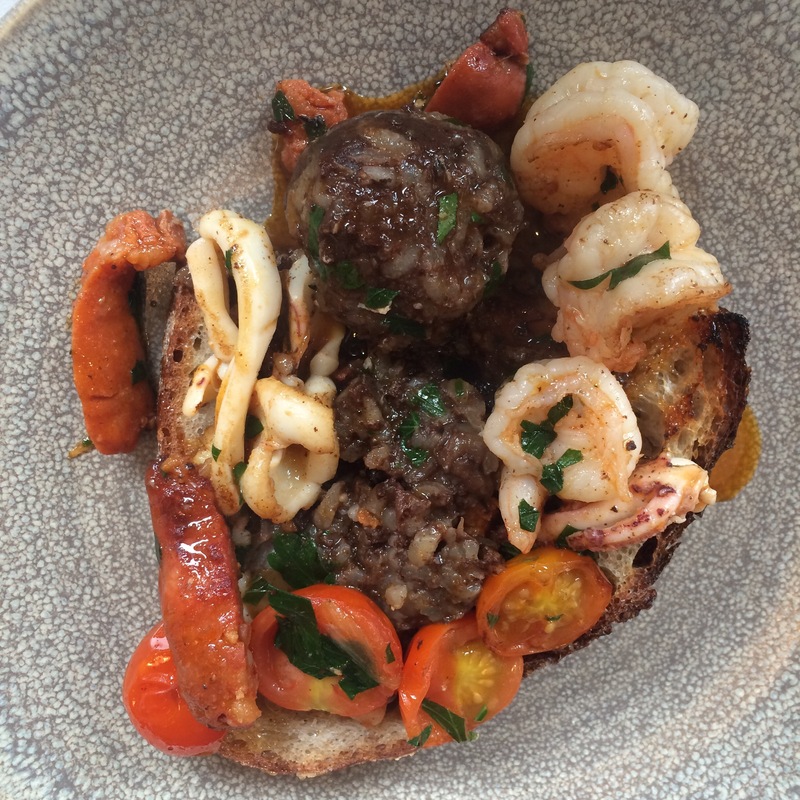 So many flavours and textures – a seafood lover’s dream. WOW. That was our response to this plate. Just, wow. It was so visually beautiful, and the colours were as beautiful as the tastes! 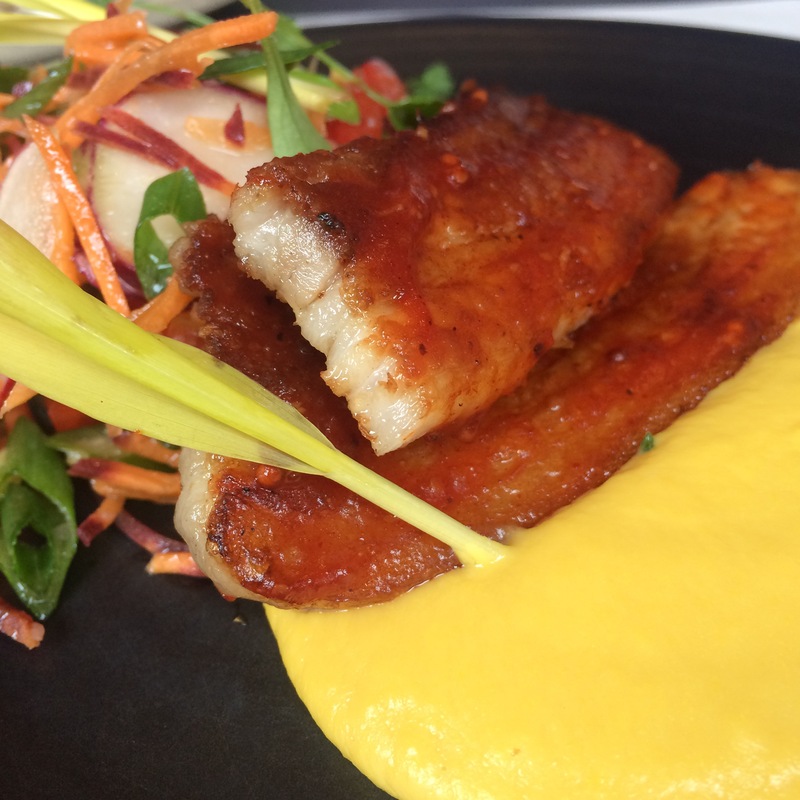 Again, a huge serving of sweetcorn purée so that we could use it generously on the goegeous pork. 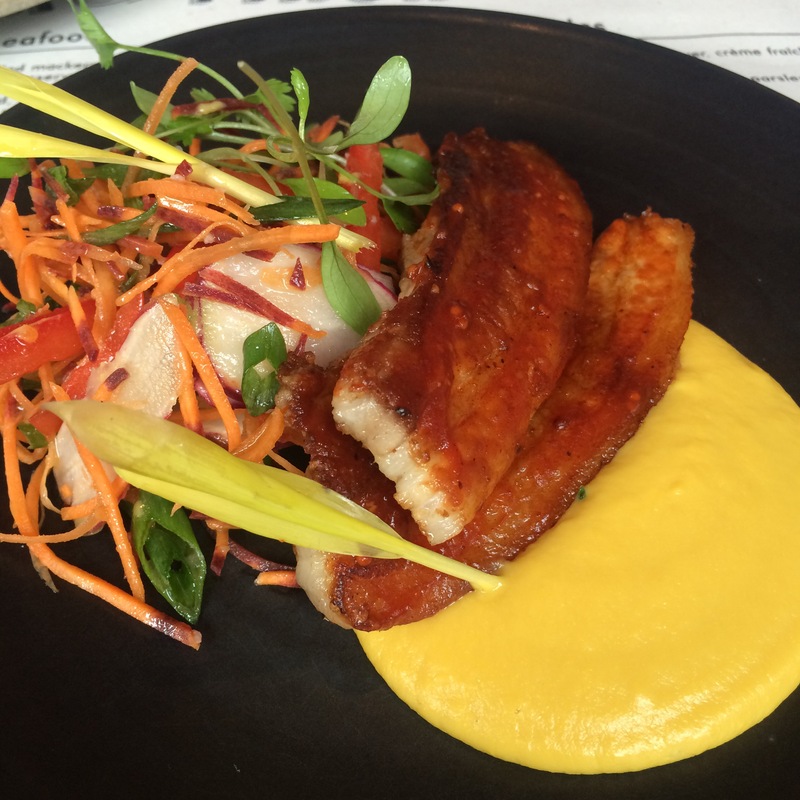 As pork belly is fatty, I can be a tricky customer. I ate this tender beauty with no hassle! Perfect! 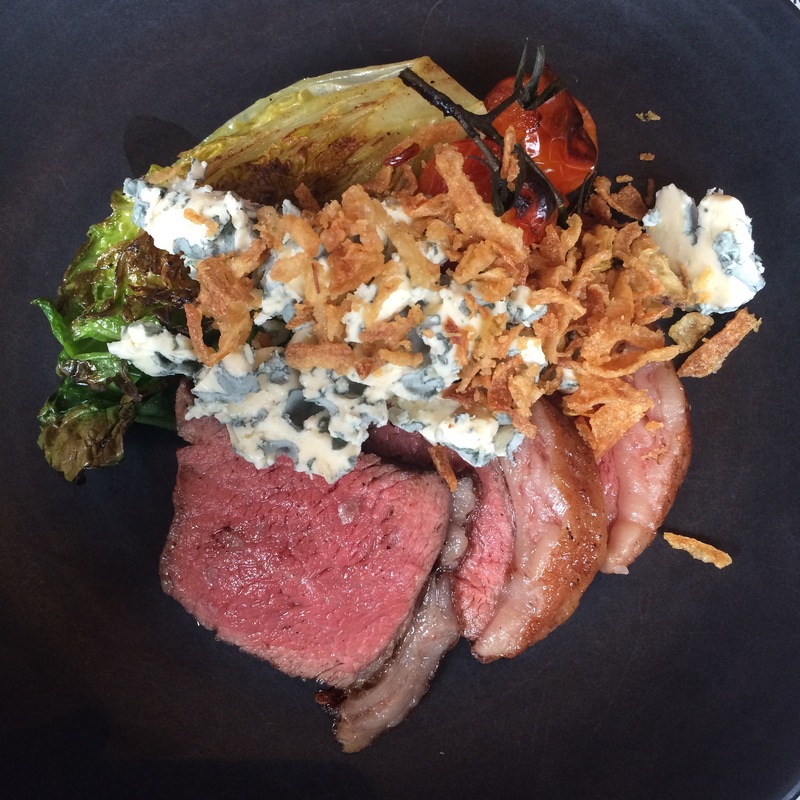 Blank Angus Flank Steak, Grilled Gem, Blue Cheese & Vine Tomato. This was our final dish and boy was it a great way to end the meal! The tender steak was cooked to perfection and served with a favourite of mine, roasted vine tomatoes, and some Fourmet D’Ambert cheese. 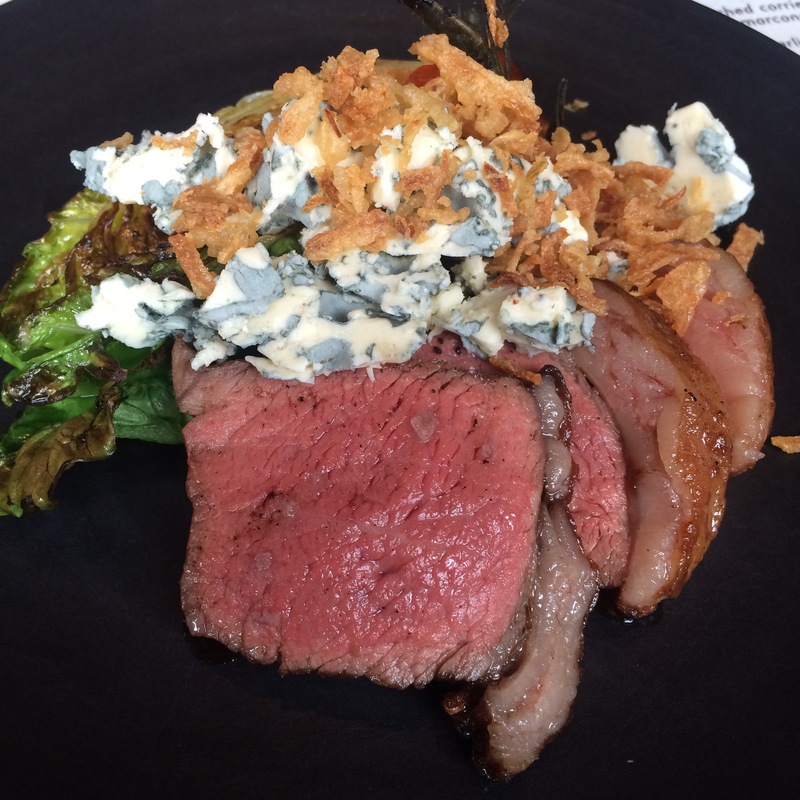 I am fussy with blue cheese, but this I really liked. Grilling gem lettuce seemed bizzarre to me but now that I’ve tried it, I get it. This photo tells the tale of two foodies who had eaten so well that a Latte & Cappucino were the only “desserts” physically possible! 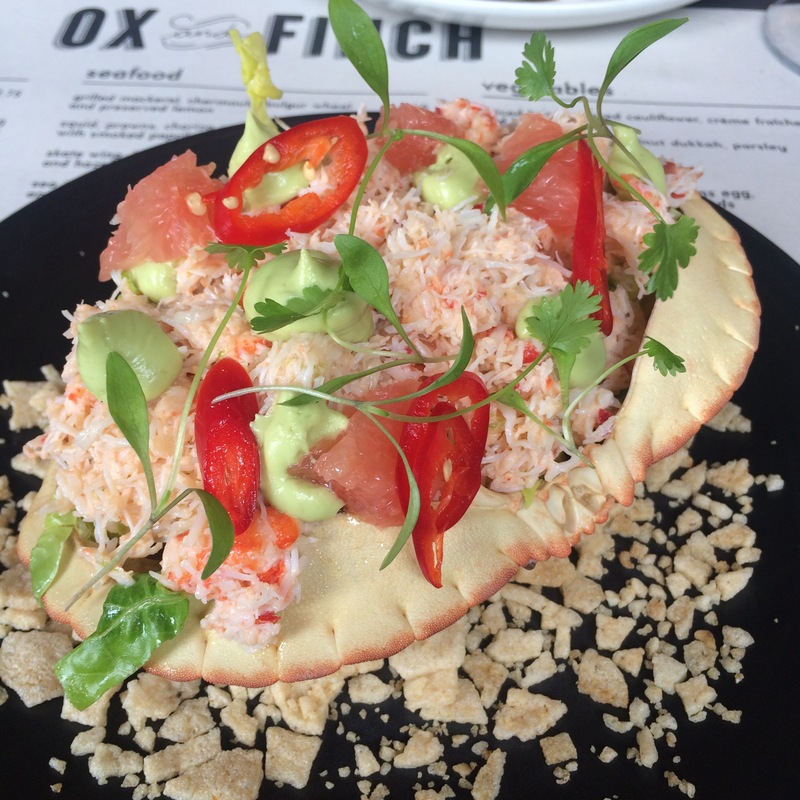 As you can see – a glowing report for Ox and Finch. We had 7 dishes between two and left stuffed! 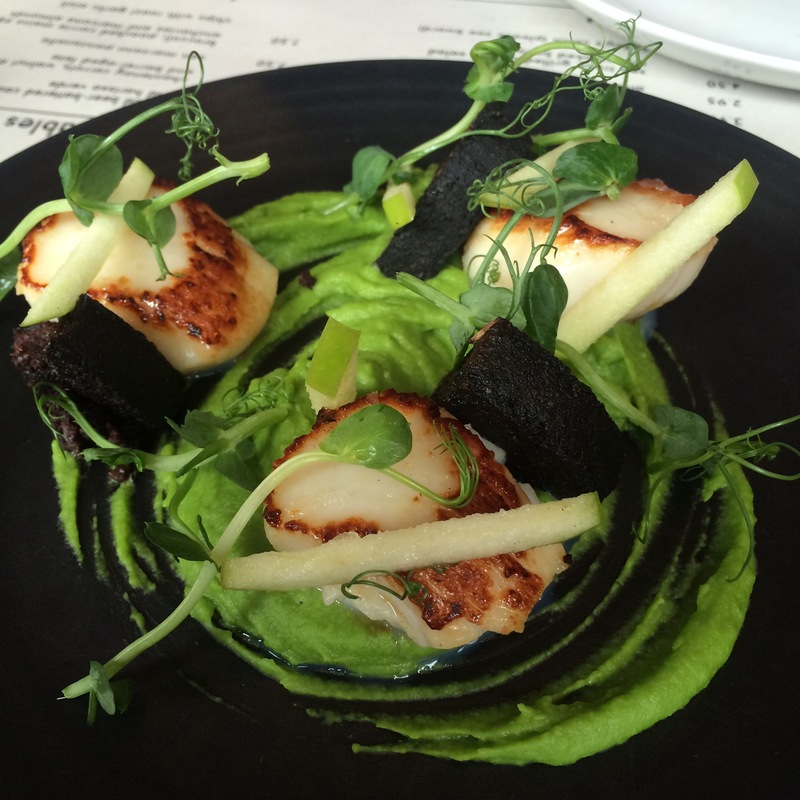 Truly outstanding food and even better service; I cannot wait to come back. It’s now up there *points* as one of my glasgow favourites.